The Good the Bad and the Ugly!! Check out the first two photo’s -very different! 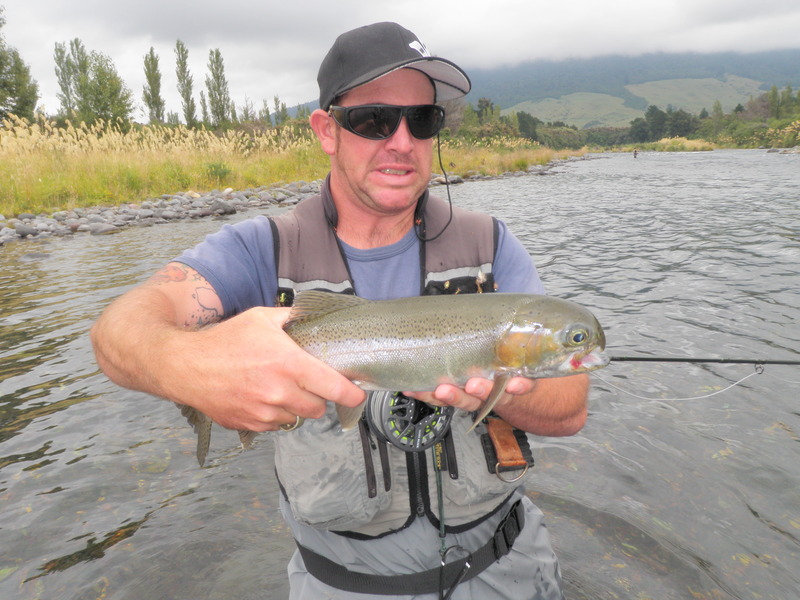 Fishing on the Tongariro this week is very muchÂ a mixed bag with some great days followed by some really disappointing sessions. The weather has also been all over the place with four seasons in one day most days, thus not helping the surge of the Cicadas. Mike and I went forÂ a stroll down river today and visited all the spots we have done well in and was disappointed to not come across one good brown or half decent pod of rainbows. This time last year this area was chokers with big hungry Cicada crunching browns which were a challenge to catch and the sport was second to none. We also had an amazing season for Cicada’s which really encouraged all trout into feeding heavily all day and gave us some easy options most days. I don’t think we are going to see the same amount of dry fly action this year as we did last year as we are just experiencing too much unsettled weather which is putting our Cicadas down to another year ofÂ hibernation. Rain , wind and sunny periods is not uncommon at the moment and we really just need a week of hot sticky temperatures to really get things pumping or otherwise we are going to miss out this year. On the other hand, some clients of mine have had some good fishing this week with some fabulous fresh fish being caught in all different areas of the river which has got most experienced anglers guessing. 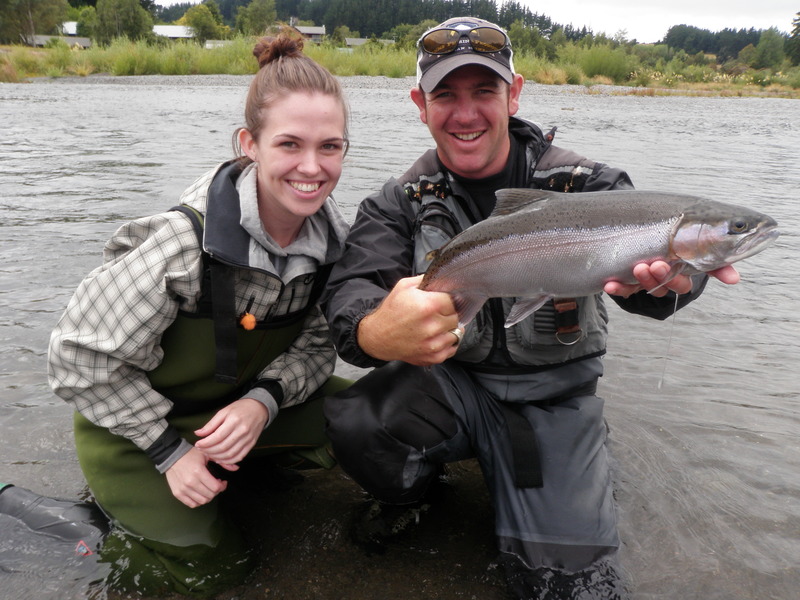 I fished with Sophie which was on holiday from Australia and she managed to land a cracker of a fish from the Honeypot which would have been as good as the fish in the winter spawning runs. Many pools in the upper river are holding average sized browns and in most cases will take a well presented nymph of scruffy dimensions. These are not the big fish we saw last year but I’m sure there are some specimens about that you would like to get your hands on if not hang tight as I’m sure they will turn up between now and March. Favourite pools have not changedÂ a lot and most of my focus has been on the Judges, Major Jones, Big Bend and the upper section around the Blue pool. 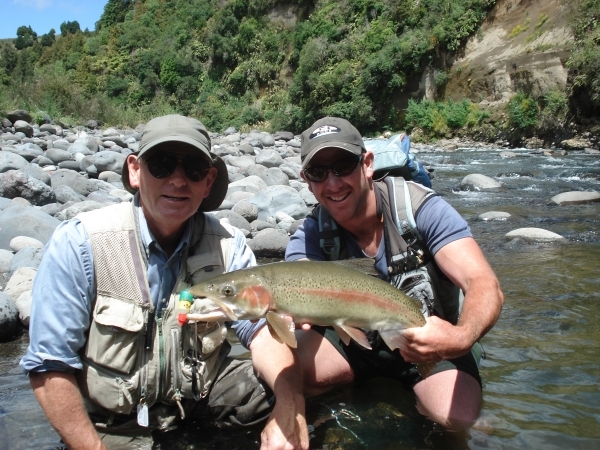 Angling pressure is great at the moment and you will hardly see another angler if you are willing to walk away from the bridge and experience what the Tongariro is all about. I think thisÂ isÂ due to all you lot thinking that this river only fishes well in the winter when the main runs are coming through but thisÂ is not the case and urge you to come up and sharpen your skills and have a crack at our summer fish. Treat this as aÂ backcountry river with all your stealthy tricks and you will catch great fish, just adjust your Tongariro tactics to suit the clear summer conditions. As I said earlier I did go for a walk down river and was dissapointed to see quite alot ofÂ good water filled in with silt from the last decent flood. The Reed pool is really shallow now which will gut some of you wetliners as is the Jone’s pool at the end of the Reed. Hopefully during the next winter flood this moves again which is quite possible remembering that the Reed is almost all sand based and has plenty of area to move about. The last picture below is of Â Roy who fished with me in the backcountry last week and enjoyed some great weather and stunning fish. Roy hooked 7Â fish for the day and landed 4 of them which were very similar to the one he is posing with in the picture. Landing fish in the back country is not easy and most anglers will only achieve about a 50% landing rate of what is hooked due to the power of the fish and the difficulty of the river. With angling pressure very low now is the time to book a night with Ross and get up to the river and see what this river holds in the way of summer action. Hope you are all well and having a great week.